Fully denitrify your wastewater: If you have nitrate or total nitrogen limits (or anticipate future limits and want to be ready), you need a system that can efficiently remove nitrates. Save space, time and money: Within the tight budgets imposed upon municipalities, implement an effective solution that doesn’t break the capital expenditures bank or multiply operating expenditures down the road. Nexom is the exclusive provider of Blue Nite biological denitrification, a simple, powerful technology for consistently lowering nitrates to <1 mg/L NOx-N. Blue Nite uses Nexom's Centra-flo® granular media filtration as an attached-growth platform in which heterotrophic bacteria can thrive and fully denitrify influent nitrates. Why do you need a Blue Nite system? Because nitrate and total nitrogen limits are proliferating in updated discharge permits across the continent, and the Blue Nite system provides a modular, end-of-pipe solution that means you never need to worry about whether you can meet your nitrate levels again. Work simultaneously in the same vessel with Blue PRO® reactive filtration for phosphorus removal to provide total nutrient removal. Blue Nite® systems utilize Nexom’s Centra-flo® continuous backwash, upflow sand filters. A carbon source is dosed to the wastewater influent prior to entering the sand filters. In the Blue Nite system, fixed-film heterotrophic bacteria convert nitrates (NO3- and NO2-) to atmospheric nitrogen (N2). The composition of the bacterial population depends largely on the specific type of carbon utilized. Bacteria and solids wasting are facilitated by the continuous backwash of the Centra-flo filter. The media washbox removes solids and excess biomass, which are directed to a reject line. The clean sand then falls by gravity back to the media bed. Design hydraulic loading rates to Blue Nite filters are dependent on heterotrophic respiration rates, influent nitrate levels, nitrate variability, dissolved oxygen (DO) levels, and expected range in water temperature. Loading rates can also be dictated by the NPDES permit or local regulatory agencies. Nexom's design parameters coupled with its proprietary control system optimizes system parameters to maintain a healthy, stable biomass for denitrification. The nitrogen gas produced during operation is primarily released from the process as the media passes through the airlift. Removal of gas in this fashion has several benefits that include: eliminating false readings in headloss, eliminating the need to backwash because of gas entrainment, and eliminating the gas bump or upset gas "burps" due to significant nitrogen bubble accumulation typical in static bed filters. The Blue Nite system is available in several models and configurations. The modular nature of the filters allows ease of system engineering and expansion. The filters are available as freestanding fiberglass or stainless steel tank units or can be configured in multi-module concrete cells. Control systems and smaller filters may be mounted on skid systems for mobility or ease of commissioning. Can this system also be configured to remove phosphorus? Since the same dosing and continuous-backwash mechanics enable Blue PRO® reactive filtration and Blue Nite’s attached growth biological denitrification, the two processes can take place simultaneously in the same tanks for total nutrient removal, with only the Blue Nite’s carbon-dosing system as additional required infrastructure while considering the biological kinetics. Learn more about the Blue PRO process, or contact us to find out how this capability could impact your plant. The Blue Nite process is the best way to consistently meet effluent nitrate or total nitrogen levels. 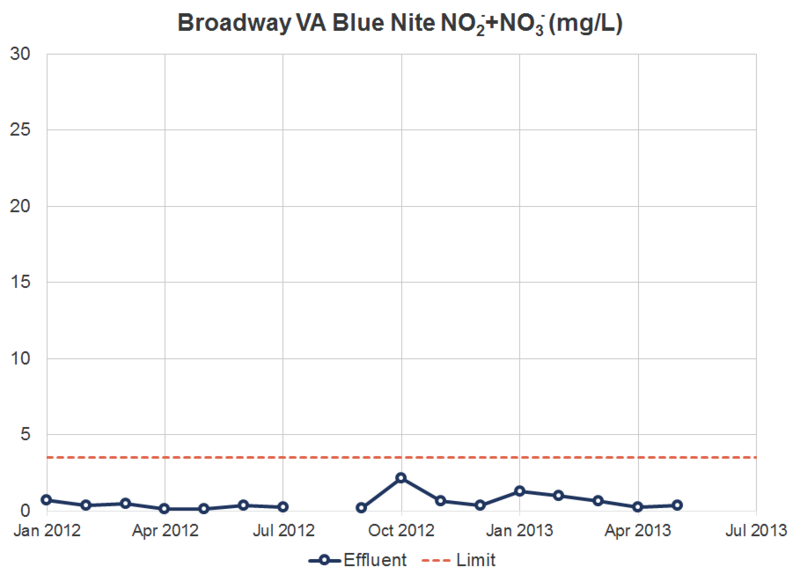 Blue Nite installations consistently beat their permitted levels as low as <1 mg/L of nitrates in an end-of-pipe solution that is seamlessly compatible with Blue PRO® reactive filtration for phosphorus removal. Want to know what Blue Nite could do for your system? Submit your RFP today and our on-staff professional engineers can help you size and design a Blue Nite to meet your wastewater treatment requirements. What carbon source does Blue Nite use? Blue Nite is flexible and can use many of the most common carbon sources, including methanol, acetic acid, ethanol, glycerin, as well as proprietary products like MicroC®. What carbon dosing ratio does Blue Nite use? Optimal carbon dosing depends strongly on water characteristics such as DO as well as the BOD strength of the carbon source. Nexom’s chemical engineers can help you determine the ideal ratio at your site to achieve the required denitrification level. Can our Blue Nite installation be retrofitted at a later time for Blue PRO reactive filtration if we don’t need phosphorus removal yet? Can the system be installed into pre-existing tanks? In some cases, the Blue Nite technology can be retrofitted to existing tanks. Contact our project development team to learn how your specific tanks could be integrated with the Blue Nite process. does the media need to be replaced or topped up? Many older sand filter design of 20 years ago were prone to occasional media loss. Our washbox design coupled with our unique control and monitoring systems mitigates this concern. A Blue Nite system will waste almost no media in its lifetime, meaning that in a 20-year period, topping up is unlikely to be required, and the media should never need to be replaced.